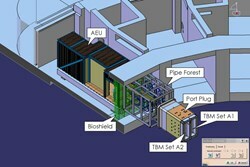 A designer's view of one of the three TBM port cells. The ITER Council Test Blanket Modules (TBM) Program Committee came together in Cadarache on 22 and 23 October. The Committee is charged with the governance of the TBM Program and it serves as an advisory committee for the ITER Council on this matter. It is formed by one governmental representative from each ITER Member and up to three experts per ITER Member from the various national laboratories and universities involved in breeding blanket R&D and in the TBM Program. In its fourth meeting since its implementation in March 2009, the TBM Program Committee addressed the ITER Organization's estimates on the required staff and hardware cost related to the TBM Program. The technical discussions addressed the progress made by each of the seven TBM teams on various R&D activities, the ITER strategy on RAMI and the estimations of the expected head loads on the TBM's first wall during the various ITER operation phases. A very important issue for the TBM Program will be the signature of a TBM Arrangement (TBMA) to be done for each test blanket system between the ITER Organization and each ITER Member acting as TBM Leader. The ITER Organization thus presented the procedure in order to achieve the signatures and a proposal for a Generic TBMA to be used as template for each of the six specific TBMA. The Program Committee now has time until the end of the year to make its comments. The objective is to have the final version of the generic TBMA by February 2011 enabling the parties to sign most of the TBMAs in 2012. The TBM Program Committee further recognized the importance of the standardization of the maintenance scheme for the Test Blanket Modules including remote handling procedures and encouraged the ITER Organization to develop the necessary mechanisms in collaboration with TBM teams.